Whipp's has become one of my favorite dessert stops Downtown. They have a very unique product which essentially consists of fresh fruit ground up into something similar to ice cream. I typically combine their whipped fruit with some type of yogurt such as vanilla tart. They also have free parking right behind their store, a rare convenience downtown! Currently, KGB Deals is running a 50% off promotion for them. Check out the deal over here! 110 E. San Fernando St. Since the dawn of low-carb-low-fat-low-calorie diets, faithful followers have been hunting down sugar-sweetened gratification that hits the spot without expanding the waistline. 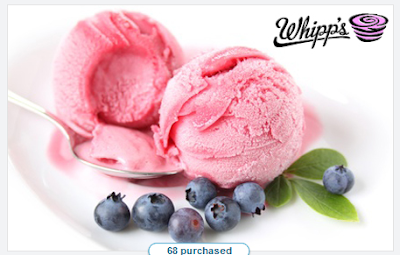 Satisfy your craving for something indulgent yet diet-friendly with today’s kgbdeal and enjoy a medium-sized frozen fruit cup for just $1.95 at Whipp’s Frozen Fruit. This health-conscious dessert destination sells tart, naturally tasty desserts that are non-fat, non-dairy, and topped with whipped fresh fruit in your choice of two seriously delicious flavors. Have your dessert and still fit into those skinny jeans with a satisfying sweet treat that somehow tastes like ice cream without all those unnecessary calories.